용담사는 백제 성왕 때 창건되었다고 전해지는 사찰로, 전설에 의하면 용담천 깊은 물에 이무기가 살면서 온갖 행패를 부리자 이를 막기위해 신라말 도선국사가 절을 창건하여 용담사라 이름을 지으니, 그 뒤로는 이무기의 나쁜 행동이 없어졌다고 한다. 전설을 뒷받침하듯 절 안의 대웅전은 북쪽을 향하여 용담천 쪽을 바라보고 있다. 불상과 광배(光背)를 하나의 돌에 매우 도드라지게 새긴 거구의 석조여래입상으로 높이가 6m에 이른다. 정수리에 있는 상투 모양의 머리(육계)가 높고 큼직하며, 얼굴은 바위의 손상으로 분명하지는 않으나 힘차고 박력있는 표정임을 알 수 있다. 목에는 형식적으로 새긴 3줄 주름인 삼도(三道)가 있다. 몸은 어깨와 가슴이 떡 벌어져 있고, 다리는 돌기둥처럼 강인해 보인다. 부처의 몸 전체에서 나오는 빛을 형상화한 광배(光背)는 깨어진 곳이 많아 분명하지는 않지만 군데군데 불꽃무늬를 조각한 흔적이 남아있다. 불상이 서 있는 대좌(臺座)는 타원형으로 거대한 자연석을 그대로 이용하였다. 이 불상은 고려 초기에 유행한 거구의 불상계통을 따르고 있으며, 그 시대의 가장 우수한 작품으로 평가되고 있다. 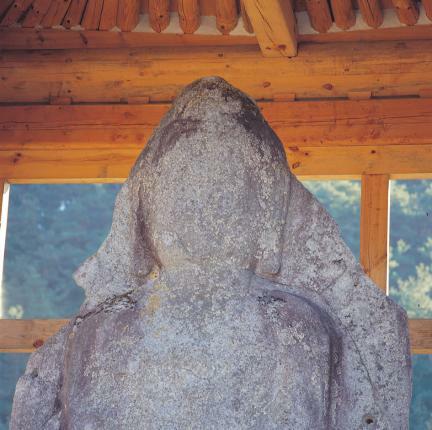 This six-meter-tall stone standing Buddha is located at Yongdamsa Temple, which is thought to have been built during the reign of King Seong of the Baekje Dynasty. 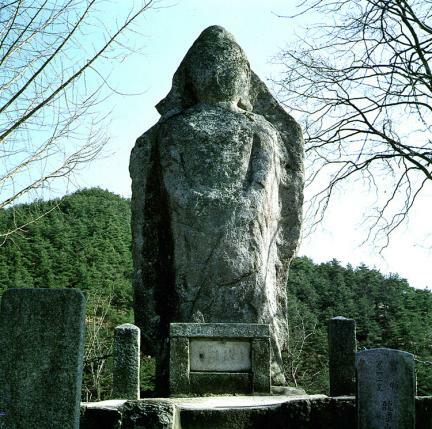 According to a legend, during the late Silla Dynasty, a monstrous serpent living in the depths of Yongdamcheon Spring was causing a lot of distress and trouble. 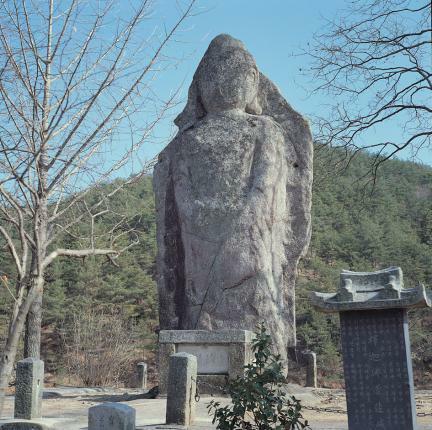 However, the serpent stopped playing mischief when Doseon, one of the greatest monks of Korea, built Yongdamsa Temple. As if to confirm the legend, Daeungjeon Hall faces north toward Yongdamcheon Spring. 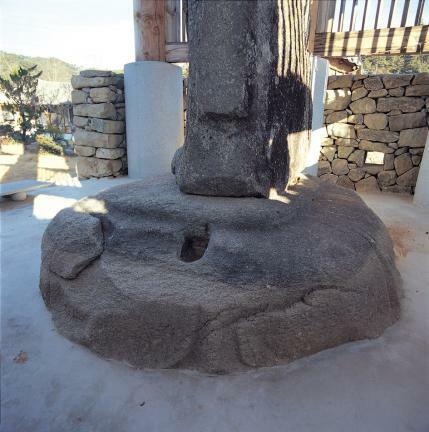 This tall Buddha statue displays a prominent front, with both the Buddha's head and mandorla (Buddhist halo of light) carved from a single block of stone. The top of the head has a large usnisa (a protuberance symbolizing supreme wisdom), and the facial expression is powerful and exudes energy, despite the damage done to the rock. The three wrinkles on the neck represent the Samdo (the three ways to attaining enlightenment). The body is stout with broad shoulders, and the legs look as sturdy as stone pillars. The mandorla (Buddhist halo of light), which expresses the light emanating from the Buddha’s body is cracked and unclear in many places, but traces of spark patterns remain on it. The oval pedestal was carved from a large piece of natural stone. This statue of Buddha is regarded as the best remaining example of the large Buddha statues commonly produced during the early Goryeo Period.